Clarksville, TN – Starting May 25th, let the Roxy Regional Theatre‘s “The Wedding Singer” take you back to a time when hair was big, greed was good, collars were up, and a wedding singer might just be the coolest guy in the room. 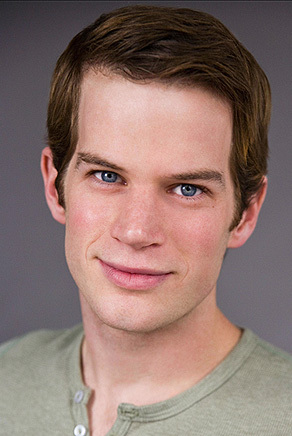 It’s 1985, and rock-star wannabe Robbie Hart is New Jersey’s favorite wedding singer. He’s the life of the party, until his own fiancée leaves him at the altar. Shot through the heart, Robbie makes every wedding as disastrous as his own. 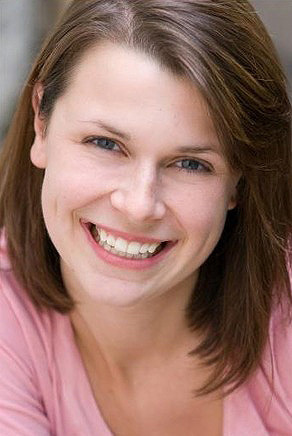 Enter Julia, a winsome waitress who wins his affection. Only trouble is, Julia is about to be married to a Wall Street shark, and unless Robbie can pull off the performance of a decade, the girl of his dreams will be gone forever. With a brand new score that pays loving homage to the pop songs of the 1980s, audiences will be grooving to the tunes in this hilarious musical comedy based on the hit movie starring Adam Sandler. Starring Josh Bernaski as Robbie and Ashley Laverty as Julia, “The Wedding Singer” is directed by Tom Thayer, choreographed by Jessica Davidson and features Jama Bowen, Ryan Bowie, Hannah Church, Kaitlin Doughty, Regan Featherstone, Sara Fetgatter, Humberto Figueroa, Leslie Greene, Erin Keas, Travis Kendrick, Sean Ormond and Rob Rodems. This production is made possible in part through the generous support of Bridgestone Metalpha USA, Inc., and Budweiser of Clarksville. 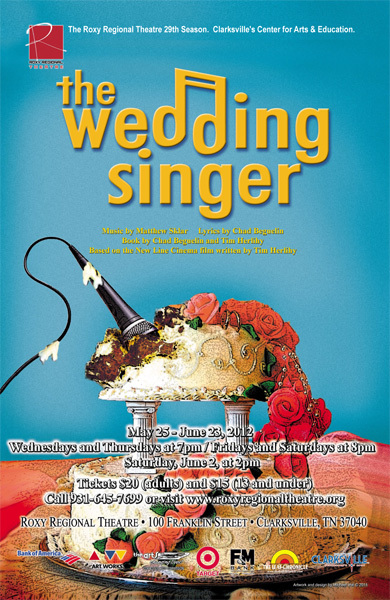 “The Wedding Singer” runs May 25th through June 23rd, playing Wednesdays and Thursdays at 7:00pm and Fridays and Saturdays at 8:00pm, with a 2:00pm matinee on Saturday, June 2nd. Tickets are $20.00 (adults) and $15.00 (ages 13 and under) and may be purchased online at www.roxyregionaltheatre.org, by phone at 931.645.7699, or at the theatre during regular box office hours (9:00am to 2:00pm, Monday through Friday). The 8:00pm performance on Friday, May 25th, is our regular pay-what-you-can preview; all tickets not pre-sold at the regular ticket price will go on sale at 7:30pm for whatever price you wish to pay. At any performance of “The Wedding Singer”, patrons may come dressed as brides and/or grooms and receive two tickets for the price of one. Reservations are not accepted for this offer, and there are no rain checks. On Saturday, June 2nd, the Roxy will hold a karaoke contest at the Downtown Market on Public Square from noon until 1:00pm. Following the contest, patrons can enjoy a wedding reception in the Roxy’s lobby, complete with wedding cake, drinks and hors d’oeuvres, before viewing the 2:00pm performance of “The Wedding Singer”.